Today’s Flash Back Friday comes from Episode 143, originally published in May 2013. 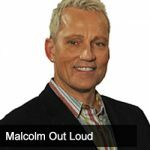 Malcolm Out Loud is the Host of Malcolm Out Loud TV. He and Jason talk about the ban on over-sized drinks and whether they will do anything to help with the obesity epidemic?Malcolm is not a fan of the government still feeling the need to regulate private business’ decisions on the products they sell… but remember, it was the banks who were selling risky products that ended up bringing down the economy. Malcolm shares other bans being considered to limit our right to choose how we consume. He also analyzes why North Korea feels threatened by the US? Malcolm is a published author, speaker and the talent behind a daily radio feature, the Out Loud Minute. Every day Malcolm leads an assault on mediocrity, constantly inspiring others to get Out Loud in every aspect of their lives.